Note: this backpack was sent to me from Aer for the purposes of this review. Aer was one of the first companies I saw doing a duffel pack — a duffelbag-backpack, hybrid. I see them all over when I am shopping around for bags, and they’ve always intrigued me. I never tested the first version, so this review is based solely on what the Duffel Pack 2 is. Aer makes this bag targeted at people looking for one bag to carry all their work gear along with their gym gear — in that sense this is a niche bag. However, in practice it’s a fairly normal backpack and can be used as such. To test the bag I took it on a long trip to the Washington Coast, and put it through its paces there. At 24.6 liters this bag is a fairly average sized backpack, though it looks a bit larger than most given the depth being greater than a standard bag. However, liter calculations are not everything in a bag, because this bag feels as though it carries just as much (if not more) than my 26 liter bags do. All in all, this is a large bag, which I can easily pack for a week in, and most people could pack for an overnight in. The back area for all your gadgets is ample in size and organization. Speaking of organization, there are a ton of little pockets throughout this bag, which makes it quite nice when you are loading out a bunch of smaller items. It also helps to distribute the weight and bulk across the bag. I mentioned above, but the area for your tech gear is right against your back with a suspended and padded laptop compartment, two pouches, and one zippered mesh pocket. 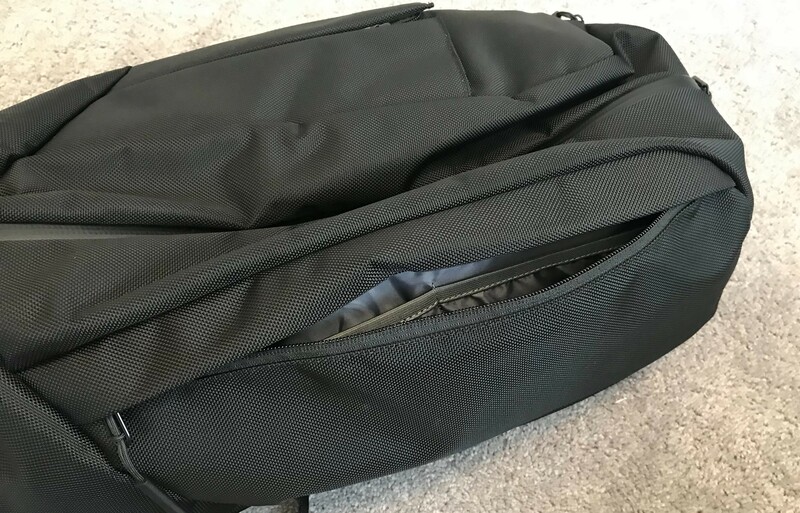 There’s a small gap of room between the laptop pocket and the bag, where you could stash a magazine or other thin items. There’s also a shallow pocket at the top of the bag suitable if you are one of those people bag designers design iPhone pockets for, where you can fit an iPhone I guess.1 There’s a side pocket as well, with two internal organizers — both with quick access. Not a fan of how this area opens. But back to the pocket along the back of the bag: it opens oddly. It zips down farther on one side than the other, thus allowing it to be bent open, but not fully open. It’s an odd decision, and one necessitated by the side carry handle. I love this side access pocket, it’s very handy. All bags which are thick suffer the same potential issue: pulling you backwards. If you can’t keep the weight close to your body, then you are not going to be comfortable. Aer mitigates this by forcing the laptop close to your body, but if you aren’t carrying a laptop then things tend to pull you back a bit. 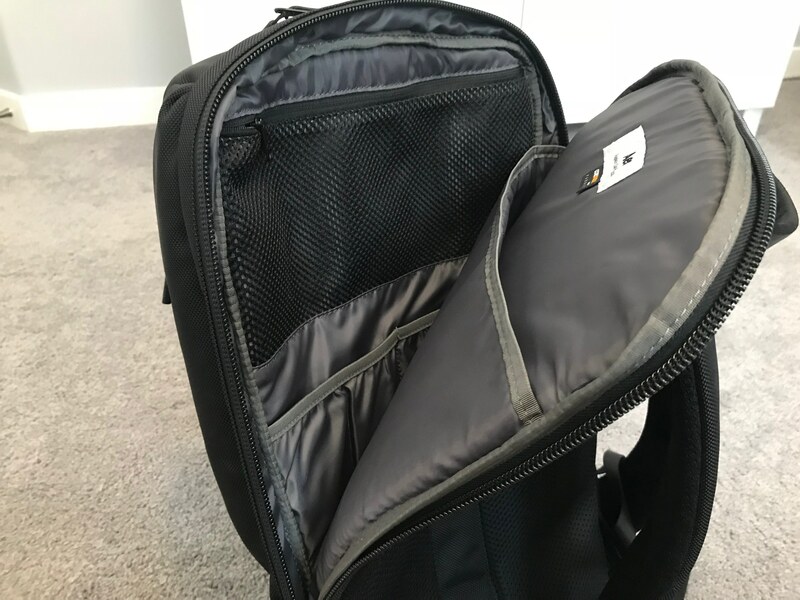 This bag also has no internal framesheet, instead relying on your laptop to provide that rigidity, and without such a device in the bag, your prone to having a lumpy area at the back of the bag. However, the target market for this bag isn’t likely to use it without a laptop stowed, making these two issues a bygone. Instead, let’s focus on the straps. They are wide, contoured, and have (as far as I can tell) two layers of padding in a very slim profile. One very soft, right against the mesh, and one much more rigid and dense at the top side of the straps. When wearing the bag fully loaded, it’s actually very comfortable to carry. I carried this bag through a wide variety of areas and my thoughts were always the same: comfortable, and stable. The bag feels very stable on your body, which is surprising given that there is no waist strap (and to be clear I loathe waist straps). While this is indeed a large looking bag, it has a nice non-tactical, non-hiker, look to it. It’s a nice and cleanly designed bag. I particularly like the large weather sealed zipper which runs the length of the bag. I don’t ever go to a gym, so I wasn’t able to test how it works for that. Instead I packed all my electronics in the bag, as well as clothes for 5 days. I was impressed with how well the bag packed, and how easy it was to get at any one item I wanted in the bag. A duffel like this will always be a bit tricky to pack and get full, but you can also more readily stuff things into the bag. It’s a nice tradeoff and one of the reasons duffelbags remain very popular. I find two pockets on this bag a little hard to use. The first is the water bottle sleeve, even though it has a nice retainer cord, it’s still not ideal. I’d much rather be another pocket that zips shut. I don’t often see people using water bottle pockets like this, so I always find them a bit of a waste. The second pocket I struggle with is the dedicated shoe compartment. Yes, it holds shoes fine, and is vented to allow the stink to escape. However, all it does is eat into the main compartment of the bag. Even packing just flip flops in the pocket for my trip, made me lose a lot of space. This is the single most specialized and niche part of this pack. If you need an extra pair of shoes with you, this is great, if you don’t, it’s a bit of a waste. Aside from that, it was a joy to use this bag. Everything is well protected and neatly organized. The only thing I would change, is to cut off all the metal zipper pulls, they are loud. But I wish I could think of a way to do that, and retain the corded pulls Aer uses without the metal tabs on the zipper — because they are fantastic. But alas, I think they would pull right off the zipper itself. I really like this bag. It’s nice to have a smooth nylon bag when you wear soft Merino wool shirts, as it won’t snag or pill them. It looks sharp and makes for a nice travel bag for me. If you take shoes with you on a daily basis, then I can’t think of a better bag to recommend for you. Even if you don’t, if you want something which excels at carrying your work electronics, as well as some clothing options, this is a really smartly organized backpack. You’ll struggle to use packing cubes in the duffel part, so you need to pack without them, but in doing that you gain a lot more space in this bag. A very nice bag indeed. You can find Aer’s duffelpack 2, here. A unique and smartly organized duffle/backpack hybrid bag.